To say the least, I was excited to visit Toronto for the first time last month, and even more thrilled that I would be staying at the newly renovated Radisson Admiral Hotel Toronto-Harbourfront. 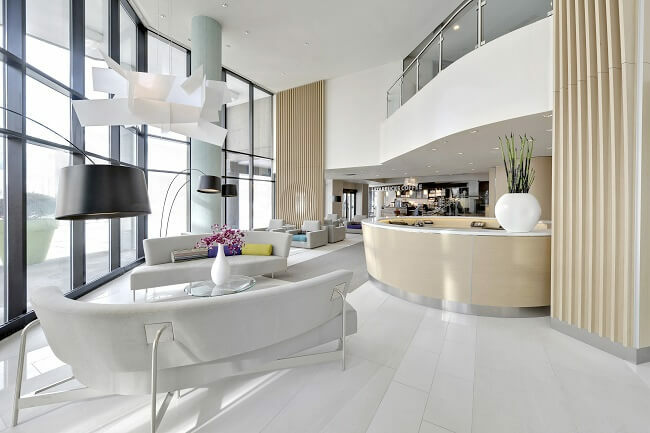 This downtown Toronto hotel is an intimate boutique-style, harbor front hotel, located in the construction-filled Toronto. The $3.5 million renovation was completed in April 2014, and the refreshed look brings a contemporary modern class to this property. 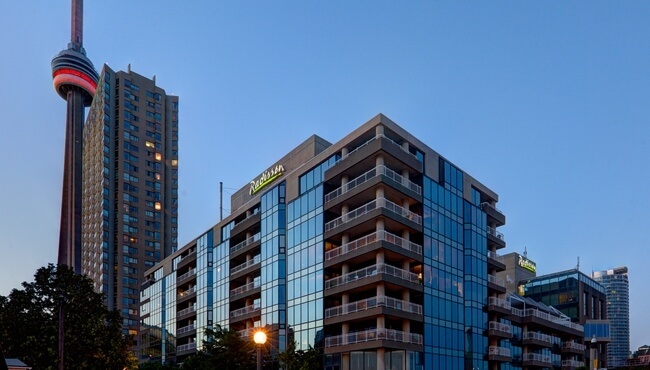 Exterior of Radisson Admiral Hotel Toronto-Harbourfront located in downtown Toronto. My afternoon flight landed late evening at the Toronto airport, and even after going through customs, I was at the harbor front hotel in less than 90 minutes after landing. My driver skillfully brought me to the 157-room Radisson Admiral Hotel Toronto-Harbourfront, zigzagging through a maze of construction in downtown, preparing for the upcoming Toronto 2015 Pan Am Games. From curb side, a few steps and I entered the hotel. To the left was a Starbucks and to the right, the high-ceiling, brightly lit lobby with its fashionable living room-like furniture with the focal point the reception desk. Check-in was a breeze, and the elevators were conveniently a few steps away, whisking me to my 3rd floor room. A long, but wide hallway led to my harbor front hotel room. I immediately noticed the amazing hardwood floors and again the very chic contemporary furniture. Business travelers will also appreciate the oversized desk and complimentary WiFi (very fast and easy to access). But when you open the curtains, the view of the marina and Lake Ontario from the huge windows was priceless. After grabbing a bite to eat at the nearby sports bar, I fell into the plush pillowtop beds and was asleep in minutes. Other in-room amenities include mini refrigerator, coffeemakers and flat screen. The bathroom was another nice surprise with wide sink and large shower. Impressive dining options are available within the hotel. The Watermark Restaurant dishes regional Canadian cuisine three meals a day. I enjoyed breakfast buffet each morning, including delicious Canadian maple syrup (of course!) and fresh meat. To the right of the entrance is Watermark Lounge with views of the outdoor rooftop Splash Pool Patio and Terrace, both serving drinks and light snacks. Also served is a spectacular view of the Lake Ontario and Toronto Islands. From its harbor front location, hotel guests can literally walk to the CN Tower and Rogers Centre, home of the MLB’s Toronto Blue Jays and the Canadian Football League’s Toronto Argonauts. 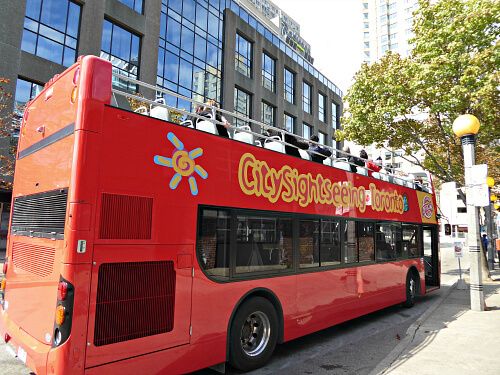 Public transportation is also within minutes.Right outside the hotel’s front door, hop on the Toronto Double-Decker City Tour, courtesy of City Sightseeing Toronto. This is an affordable way to see Toronto with 21 stops, and again convenient to the hotel. From the moment you arrive at the Radisson Admiral Hotel Toronto-Harbourfront, the hotel staff is more than accommodating. The renovation has stepped up the game for this Toronto hotel as well as the Radisson brand. Here you have access to everything Toronto, from entertainment, shopping and major attractions. Put the Radisson in Toronto on your radar, and be sure to request a harborfront room! 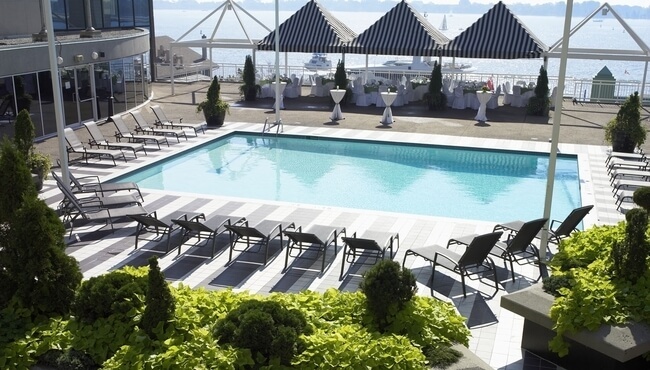 Rates at Radisson Admiral Hotel Toronto-Harbourfront: low season start at $169; peak season start at $249. You can book direct or compare rates on Priceline or Hotels.com. Accommodations courtesy of Radisson Admiral Hotel Toronto-Harbourfront. Photos courtesy of Diana Rowe and the Radisson.